Home » Rock News » METALLICA, THE BLACK KEYS, BRUCE SPRINGSTEEN, DAVE GROHL, and MORE SET TO ROCK ‘CONCERT FOR VALOR’ IN WASHINGTON, D.C.
Today, a stellar line-up has been announced for The Concert for Valor in Washington, D.C. Rock icons Metallica, The Black Keys, Bruce Springsteen, and Dave Grohl (Foo Fighters) along with Eminem, Zac Brown Band, Carrie Underwood, Rihanna, and Jessie J, will come together to honor our country’s veterans and their families. 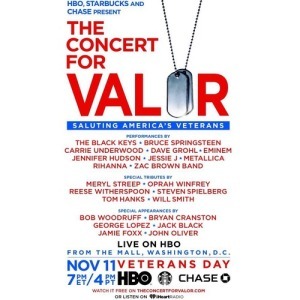 The show is set to take place at 7pm ET/4pm PT at The Mall in Washington, D.C. on Veteran’s Day (November 11). HBO and Starbucks have partnered to present the event, and Gary Goetzman, Joel Gallen, and Tom Hanks will be co-producing. This concert will be nothing new for Goetzman and Gallen, who produced and directed respectively The 25th Anniversary Rock and Roll Hall of Fame Concert and the 2014 Rock and Roll Hall of Fame Induction Ceremony. HBO will be broadcasting the show live and online at TheConcertForValor.com. In addition, special appearances will be made by Meryl Streep, Steven Spielberg, Tom Hanks, Jamie Foxx, John Oliver, Jack Black, Bryan Cranston, Bob Woodruff, George Lopez, and more. Tagged black, Bruce Springsteen, carrie, carrie underwood, concert for valor, dave, Dave Grohl, eminem, fighters, foo, Foo Fighters, grohl, hbo, keys, Metallica, national mall, rihanna, The Black Keys, the black keys concert for valor, underwood, washington d.c., zac brown band.